In the previous years, most of the times there was only one link available at official UPTET website to download the Admit Card / Examination Hall Ticket. We haven’t noticed any major problem / error with the process of downloading the UPTET Admit Card. We don’t know what happened this year (2018), there are bulk of UPTET candidates who are reporting this unknown error / problem while trying to download their UPTET 2018 Admit card. We understand that due to the hon’ble High Court’s orders against the Shiksha Mitra, the UPTET applicants are much much higher this time in UPTET 2018 Examination. 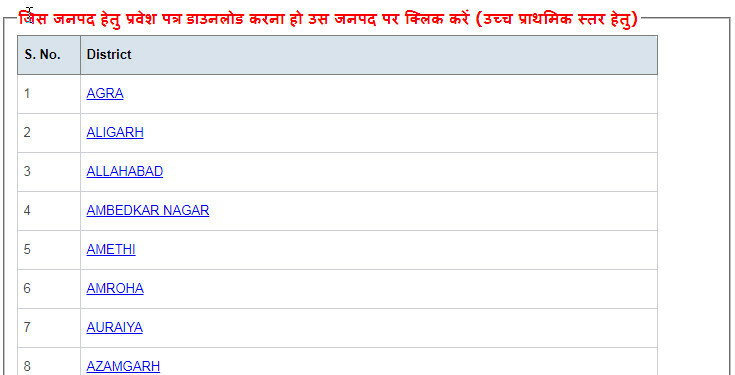 To counter attack the UPTET 2018 candidates rush, UPBEB (Uttar Pradesh Basic Education Board) has already released 3 district wise UPTET Admit Card download links / locations but still many of the UPTET candidates are unable to download their UPTET 2018 examination hall ticket / Admit Card. UPTET 2018 Admit Card Download Links / Locations. UPTET 2018 Primary Level (Paper-1) Admit Card Download LINK (will be updated shortly). UPTET 2018 Upper Primary Level (Paper-2) Admit Card Download LINK 1 (will be updated shortly). UPTET 2018 Upper Primary Level (Paper-2) Admit Card Download LINK 2 (will be updated shortly). How to Download UPTET 2018 Admit Card / Examination Hall Ticket. UPTET 2018 Admit card / Examination Hall ticket is available to download from 5 October 2018 onwards. Below is the complete guide about how to download UPTET 2018 Admit Card. 1)- First of all visit official UPTET Website following this link. 2)- Once you landed on to the official UPTET 2018 website, click the respective (Primary or Upper Primary) link under the “परीक्षा हेतु प्रवेश-पत्र प्रिंट करें-” heading. Important: There are 2 download links for the UPTET upper primary level (Paper-2) and 1 download link for the UPTET primary level (Paper-1). 3)- After following the respective UPTET admit card download link, select the DISTRICT from where you have register for the UPTET 2018 Examination. Important: Please don’t open this districted wise UPTET admit card link in the new window or process. 4)- Now, just provide your 10 digit numeric UPTET registration number and the date of birth in DD/MM/YYYY format in the appropriate input boxes and HIT the PROCEED button. 5)- Once you landed on the UPTET 2018 Admit Card page, hit the print button to save / download or print your UPTET 2018 Admit Card. 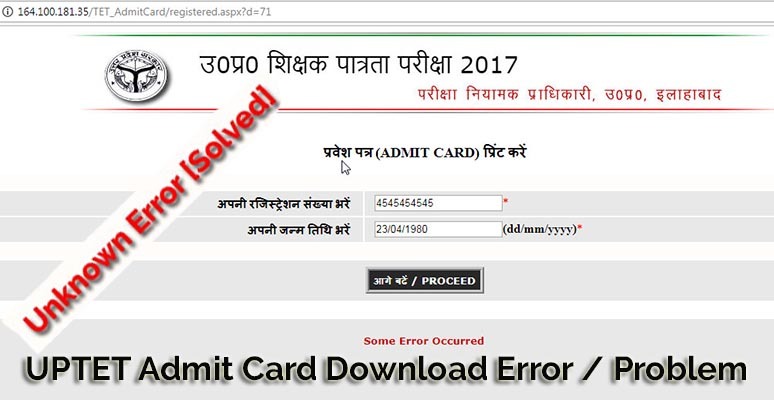 UPTET 2018 Admit Card Download Problem / Error. Possible Reasons for UPTET 2018 Admit Card / Examination Hall Ticket Download ERROR “Some Error Occurred”. You may entering wrong UPTET 2018 registration number or D.O.B information. Double check the supplied UPTET registration number and date of birth of the candidate. Most of the times, the candidate’s UPTET 2018 registration number will consist of 10 numeric digits and you have to enter the date of birth in DD/MM/YYYY format. Avoid downloading UPTET 2018 Admit Card in the peak hours (10 Am to 8 PM). As most of the UPTET candidates hires the professional operators to get this job done for them. These professional operators usually works between 10 Am to 8 Pm, so try downloading the UPTET 2018 Admit Card in the off-peak hours. Have you tried clearing the internet browser’s cookies. Believe or not, many time deleting the browser’s cookies resolve these type of unknown error / problems. In Google Chrome browser, you can anytime delete the system cookies by following 3 Vertical dots at top-right in Chrome browser > Settings > Advanced > Clear browsing data > Cookies and other site data. 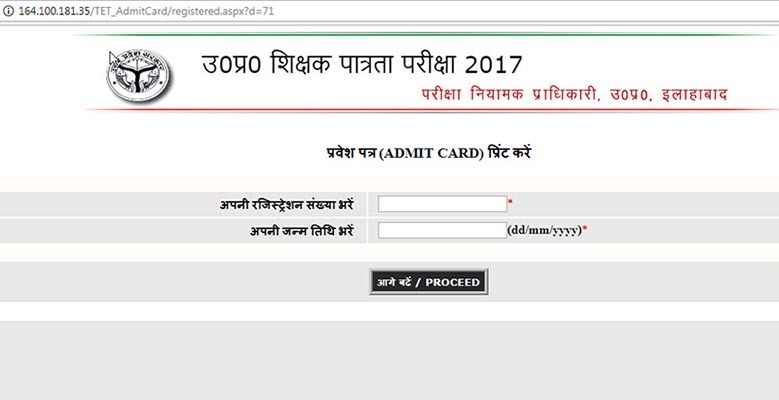 While downloading UPTET 2018 Admit card, please don’t open any process in new window. Just follow all the respective links and try to remain on the parent window. If any of the above option didn’t worked for you, there are strong indications that the official UPTET 2018 server is down or under maintenance. Do try your luck to download UPTET 2018 Admit card at some other time. At last, we want to wish you best of luck for your coming UPTET 2018 Examination. Once you are able to download the UPTET 2018 Admit card, please carefully read all the important instructions and document required at the UPTET Examination Hall / Center.